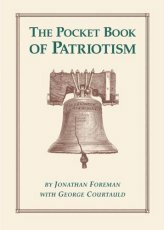 Many things have been said and written on the subject of patriotism, some of them concerning the exploitation or abuse of patriotic feeling. Perhaps the most famous if misunderstood quotation on the subject was a throwaway remark by Dr. Samuel Johnson, the 18th-century English wit, poet, and lexicographer. It was he who said that "patriotism is the last refuge of a scoundrel." That is something that can certainly be true, though the good doctor was likely referring to the Patriotic party in the British Parliament of the time. He himself wrote an approving essay entitled "The Patriot," and defined "patriot" approvingly in his Great Dictionary of 1755 as "one whose ruling passion is love of his country." Below is a selection of quotations about America and patriotism from a variety of persons who tend to see patriotic feeling as something more than mere ancestor worship or tribal identity. Some of them are famous, others are today obscure. But their words speak to what it is to be an American patriot today. "Each man must for himself alone decide what is right and what is wrong, which course is patriotic and which isn't. You cannot shirk this and be a man." "The patriots are those who love America enough to see her as a model for mankind." "From the very beginning our people have markedly combined practical capacity for affairs with power of devotion to an ideal. The lack of either quality would have rendered the other of small value." "If the American dream is for Americans only, it will remain our dream and never be our destiny." "France was a land. England was a people. But America having about it still that quality of the idea, was harder to utter -- it was the graves at Shiloh, and the tired, drawn, nervous faces of its great men, and the country boys dying in the Argonne for a phrase that was empty before their bodies withered. It was a willingness of the heart." "Americanism means the virtues of courage, honor, justice, truth, sincerity and hardihood-the things that made America. The things that will destroy America are prosperity at any price, peace at any price, safety first instead of duty first, the love of soft living, and the get-rich-quick theory of life." "One cannot be an American by going about saying one is an American. It is necessary to feel America, like America, love America and then work." "His foreparents came to America in immigrant ships. My foreparents came to America in slave ships. But whatever the original ships, we're in the same boat tonight." "The United States is like a gigantic boiler. Once the fire is lighted under it, there is no limit to the power it can generate." "True patriotism springs from a belief in the dignity of the individual, freedom and equality not only for Americans but for all people on earth." "He who love not his home and his country which he has seen, how shall he love humanity in general which he has not seen?"